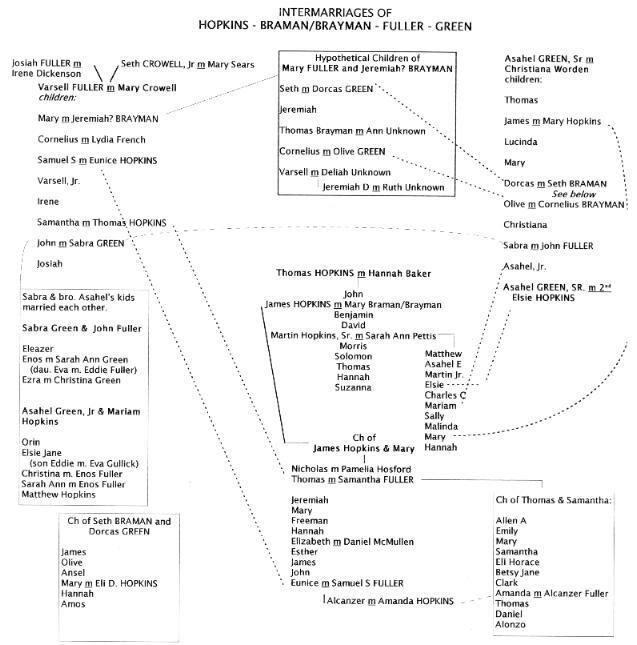 I am attempting to connect my FULLER - HOPKINS - BRAMAN/BRAYMAN, etc. lines. There are numerous intermarriages between these lines. The given names of Varsel, Seth and Cornelius are scattered throughout. Visit the RESEARCH PAGE, that combines our collected information and known facts, in an effort to further assist in putting this family puzzle together. .... 2 Seth BRAMAN b: abt. 1801 in Rhode Island d: 1874 in Argyle, Washington Co, New York, occ: Farmer. Note: Apparently moved to NY when very young, according to his son, Amos's obit. ..... +Dorcas GREEN d: abt. 1844 m: abt. 1826 in New York, Father: Asahel GREEN, Sr, Mother: Christiana WORDEN. See SETH & DORCAS on research page. .......... 4 Joel L BUSSING b: 1843 in New York d: Aug 29, 1868 in Argyle, Washington Co, New York , burial: Argyle, Washington Co, New York, cemetery: Hopkins. Note: Cemetery list shows his birth as 1848. The 1850 census lists him as 7 yrs old. ................... +Nelson BOULIER b: Mar 1842 in Canada d: Mar 18, 1921 in probably Fort Edward, Argyle, Washington Co, New York m: Dec 03, 1867 in Washington Co, New York, burial: Fort Edward, Washington Co, New York, cemetery: Union. Note: 1900 Census spelling "Nelson Bouler"
......... 5 Francis Timothy BOULIER b: Sep 1887 in Washington Co, New York . Note: 1900 Census spelling "Francis Bouler"
....... 3 Amos S BRAMAN b: Oct 11, 1842 in New York d: Feb 05, 1918 in Levis twp, Clark Co, WI, occ: 1880 Farmer, burial: Neillsville, Clark Co, WI, cemetery: Neillsville. Note: Amos's mother died when he was about 2 yrs old. He lived with his sister, Mary, and husband, Eli Hopkins, in Kalamazoo, in 1850. They moved to MI in the mid to late 1840's. After he married, they moved to WI with his wife's family. .... 2 Jeremiah BRAYMAN b: abt. 1804 in probably Argyle, Washington Co, New York d: bet. 1881 - Jun 05 1900 in Sodus, Wayne Co, New York . Note: Note: was deponant on the PENSION APPLICATION for Samantha (FULLER) HOPKINS on Apr. 19, 1881, aged 77 yrs. ..... +Anne BAKER b: abt. Oct 14, 1804 in New York d: Oct 14, 1855 in Woodbridge twp, Hillsdale Co, MI m: abt. 1830 in New York, burial: Woodbridge twp, Hillsdale Co, MI, cemetery: Sheldon. Note: Ann is buried next to Isaiah Fuller, nephew of Samuel & Eunice (Hopkins) Fuller(next row), daughter of Mary Braman. In the 1850 Woodbridge census, they are one residence away from Walter 40yrs and Abigail 30yrs Baker. ......... 5 Francis Violet WHEELER b: Aug 08, 1892 in Sonoma Co, CA d: Feb 16, 1987 in Sebastopol, Sonoma Co, CA, occ: 1940 Flower nursery grower plants, burial: Sebastopol, Sonoma Co, CA, cemetery: Green Valley M.E. .......... 4 HARRIET Anne WHEELER b: Oct 08, 1868 in Green Valley, Sonoma Co, CA d: Jan 11, 1962 in Tujunga, Los Angeles Co, CA , burial: Inglewood, Los Angeles Co, CA, cemetery: Inglewood Park. Note: Dec. 22, 1918 Harriet wrote: "1918 I am 50 years old and have entered Winter of Life, Blessed Hope blooms in my soul." ....... 3 Selden BRAYMAN b: abt. 1853 in Ohio . Note: This son would not have been born in NY when Thomas & Ann were in MI before 1850. If he was born in NY, as reported on the 1860 census, he may be the son of Thomas's second wife, Mary A. .......... 4 Marion BLOUNT b: Mar 02, 1863 in Woodbridge twp, Hillsdale Co, MI d: Feb 02, 1897 in Woodbridge twp, Hillsdale Co, MI , burial: Woodbridge twp, Hillsdale Co, MI, cemetery: Frontier. Note: Cemetery list "Maryun Householder, dau of G.W. & L.J. Blount"
.......... 4 Enos Fuller BRAYMAN b: Jul 06, 1873 in Birmingham Village, Bloomfield twp, Oakland Co, MI d: Aft. Apr 11, 1930, occ: 1900 Mechanical Engineer, 1910 Machinist auto factory, 1920-30 Machinist. Note: 1898 marriage to Hattie Conkel with in-laws Peter and Eliza Conkle and in 1910 Enos and Hattie live with in-laws John and Eliza Ent. Need explanation. ................... +Michael POSHER b: abt. 1871 in Germany, occ: 1910 Moulder ores? and copper?. Note: 1910 Surname hard to read. Name Poster/Posher/Posker/Paster/Pasher/Pasker/Parks? .... 2 Varsel Fuller BRAYMAN b: abt. Feb 21, 1816 in Ft. Edward, Washington Co, New York d: Sep 07, 1887 in Woodbridge twp, Hillsdale Co, MI, DISINTERNMENT occ: 1860 Carpenter, 1870-1887 farmer, burial: Frontier, Woodbridge twp, Hillsdale Co, MI, cemetery: Frontier. Note: Moved to MI in 1865 from Wayne Co, NY. Any and all thoughts are welcome!! !